Shola Ameobi foot injury | NUFC Blog. 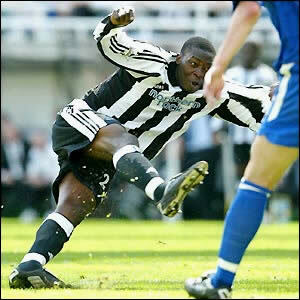 Archive for tag: Shola Ameobi foot injury. Shola and Joey footwatch: Bambi back before the end of the month? Well, you just can’t stop Chris Hughton at the moment. This time, he’s been talking about the return of Shola Ameobi, who broke his foot after scoring in a 4-3 cup thriller against the mighty Huddersfield on 26th August. Hughton said he has high hopes for a Bambi’s return to the Newcastle United squad for the encounter with Swansea on 28th November. If he did return for that game, it would mean that the ‘Fenham Eusebio’ had been out of the game for around four months, and would probably need some time to return to full match fitness. His return would also coincide with the ending of the loan period for hired in hitman, Marlon Harewood, who has had mixed fortunes as a temporary replacement. Ameobi, who seems to have picked up the very welcome habit of remembering to head the ball into the goal before he falls over this season, has been much missed in Newcastle United’s front line. 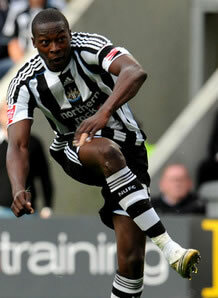 “Shola’s a player who was making a positive and big impact on the team when he was injured,” said Hughton.